Stuff cored apples with a sugar-and-spice filling and bake for a fruity fall dessert. Serve with a scoop of creamy vanilla ice cream. Preheat oven to 350º. In a small bowl combine walnuts, pecans, sugar, salt, cinnamon, cardamom, and oats. Add butter cubes and toss to combine. Peel the top third of each apple and, using a melon baller, scoop out the stem and enough of the core so that the walls of the apple are about 1/2 in. thick. Take care, however, not to break through the bottom of the apple, or the filling will leak out when baking. Make the hole a bit wider at the top. 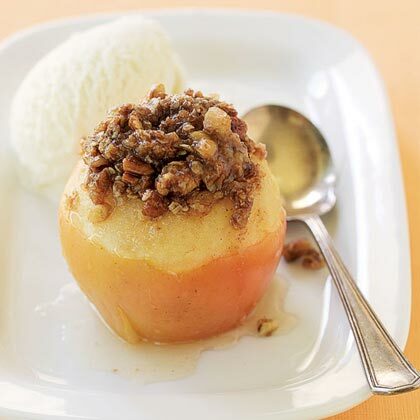 Using a small spoon or your fingers, generously stuff each apple; mound extra filling on top. Put the filled apples in a 2-qt. baking dish. Pour cider into the pan around the apples, cover the dish with foil, and bake 45 minutes. Remove foil and bake, basting every 15 minutes, for an additional 30 to 45 minutes, until apples are easily pierced with a sharp knife (they may split open a bit at the bottom). Serve apples drizzled with the sauce from the pan and with a scoop of vanilla ice cream alongside.